The day has come for you to move to Las Vegas! Congratulations! You will be living in one of the most exciting cities in the country! However, before you are ready to begin your new life, there is a lot to do! You need to find a good moving company, need to properly pack everything up, and then need to actually move your stuff over to Nevada. 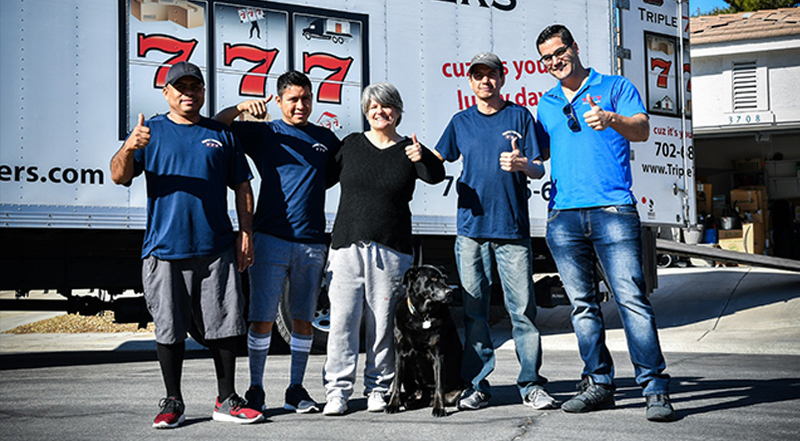 Lucky for you, Triple 7 Movers Las Vegas are there! We are here for you during each step of the move! Packing problems? We have you covered! Moving your office? You can bet we can help with that! But what makes us the best movers in Nevada – our top-rate Las Vegas movers prices! Contact us today for one of the best moving quotes Las Vegas offers. Welcome to the fabulous city of Las Vegas! Your next big adventure awaits! There are many reasons why you should pick Triple 7 Movers over any other moving company in the Las Vegas area. First, we are a family-owned business. What this means is that we know just how much family matters to someone – so we know you will put the needs of your family first. Our customers’ wishes are our priorities. So, our teams undergo special training that ensures your moves will be without stress and professionally handled. What’s more, we cater to all sorts of moving needs. From local moves Nevada to big company relocations, from packing and storing to moving your car, we cover it all! In addition, you will also be dealing with courteous and professional workers who are also efficient packers, and a supervisor with a lot of experience right on the spot! This way, even if you have any worry about your move – from packing fragile items to moving quotes Las Vegas, we can address them immediately! What goes into Las Vegas movers prices? Residential or commercial Las Vegas moving prices? We move it all! So, the question everyone is asking is how do you actually decide upon Las Vegas movers prices. What do they charge more, and what you can go without? The answer to this, however, is not that simple. As you can imagine, moving business is pretty complicated. Just like there are many, many different people and families, so there are many, many different moves. Sometimes, you have a studio apartment you want to leave behind, and sometimes it is a three-bedroom house you are completely packing. This is exactly the way a lot of online moving calculators will figure out your moving quote – based on the house size. However, this can often be wrong. What can go into your moving quotes Las Vegas? When you look at the move as a whole, it is not only the size of the house that will go into deciding Las Vegas movers rates. There are many other things you need to take into account. For example, for long distance moves Nevada, you will also want to calculate the costs of fuel and labor. These moves can often take a couple of days, so they are bound to cost more. But it’s not just that – sometimes the same size of home can cost more, simply because there is more stuff. That is a pretty obvious thing that a lot of people forget. Then, you need to think about the services you are getting. Packing services will, of course, be an added bonus to your bill. However, with them, you will be able to sleep at ease, knowing full well that your items are safe and will not be damaged during the travel. Then, when the move is a pretty big one, your things might need to stay in an overnight warehouse, which can again boost your bill. There is a simple way to get a firm grasp of these though. Ask for an in-house estimate. Figuring out the precise cost of the move is why Triple 7 Movers will send an estimator to your home. They will make sure you are packing everything you need, and, by visiting you, they will have a clear picture of just how big your move will be. That is how they will be able to give you the best Las Vegas Movers prices and estimates. Get instant moving quotes Las Vegas from our estimator. While at your house, make sure you talk to them about Las Vegas movers rates and what you expect of your move. Also, talk to them about the things you will take with you, and things you will leave. Show them every room and cupboard – they need to see everything in order to make an educated estimate. What do you get with Triple 7 Movers? So, why even ask for Las Vegas movers rates? What services can we offer, and do they match your needs? There’s no better place to find out then here! First, as we mentioned, we cover both commercial moves and the residential ones. The distance is not a problem for us – we can take you both through Nevada, and even if you are coming from out of the state! Our clients come from all over the country and we are happy to help anyone! So don’t be shy! Call us to discuss everything about Las Vegas movers prices and GET YOUR QUOTE TODAY! Moving to Las Vegas is one big adventure! All you need to do is pick up the phone and start it! We are waiting for you!